I started repotting some of the big tridents into pond baskets today. 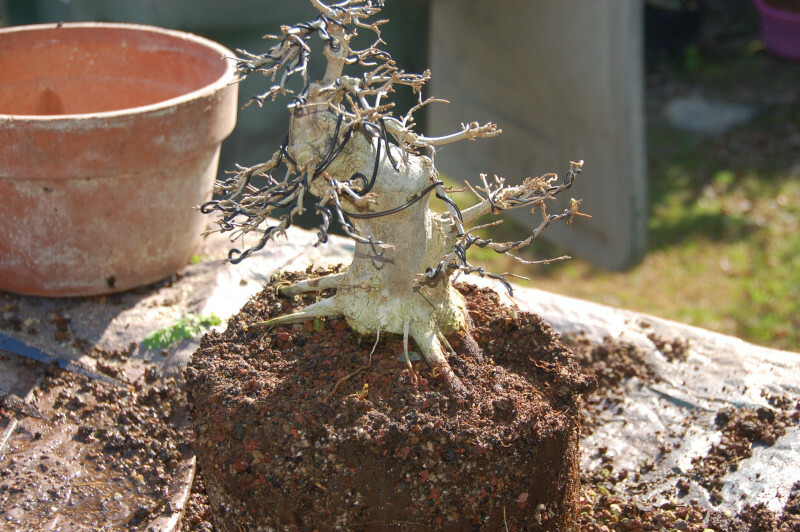 This was the first tree I repotted. 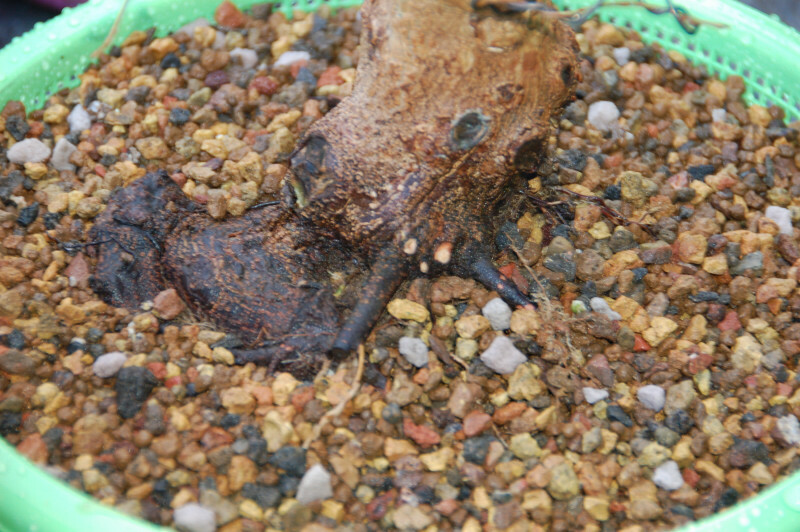 The soil had settled down in the pot and much was gone from splash out. 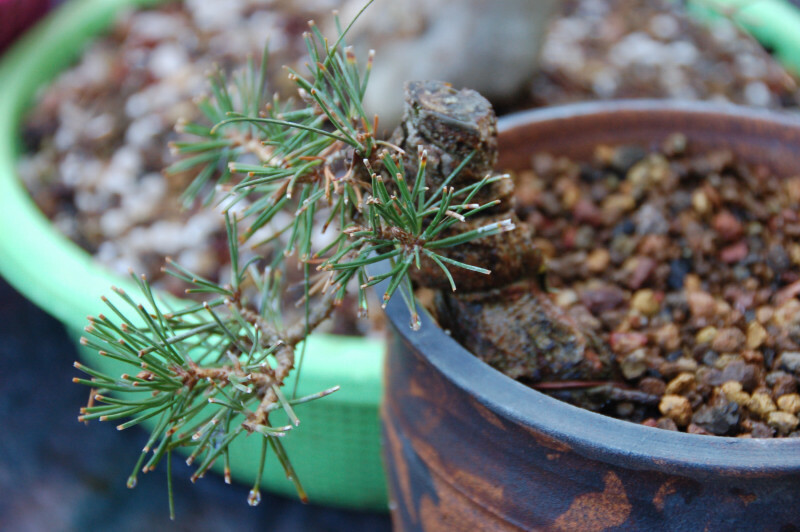 The tree will actually consume akadama and many times I have had junipers in soil for years that have no soil in them at repotting. All the soil is just consumed. 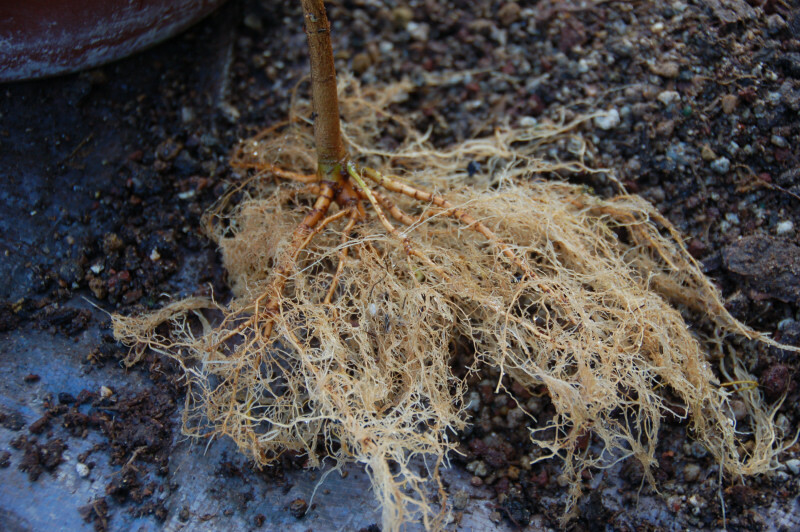 Many of the large roots can be seen with their ends sticking out of the soil. 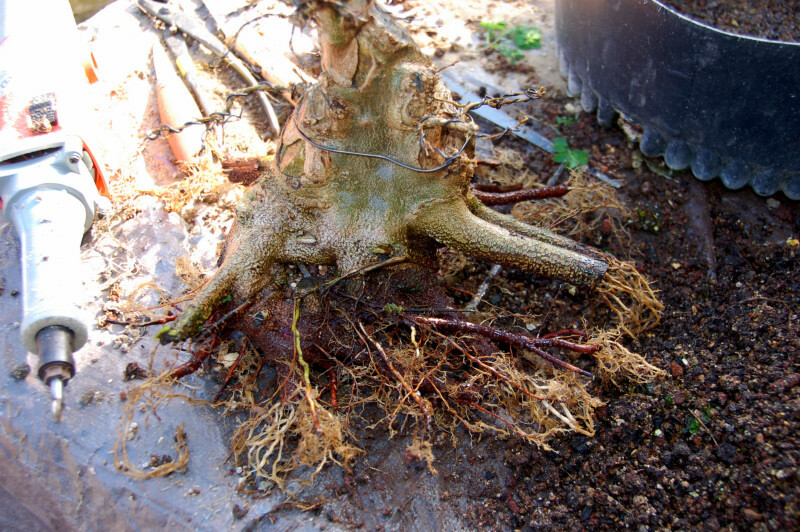 These roots are very large and while they have helped the plant with considerable flare, they will hinder me from placing the tree in a suitable pot. 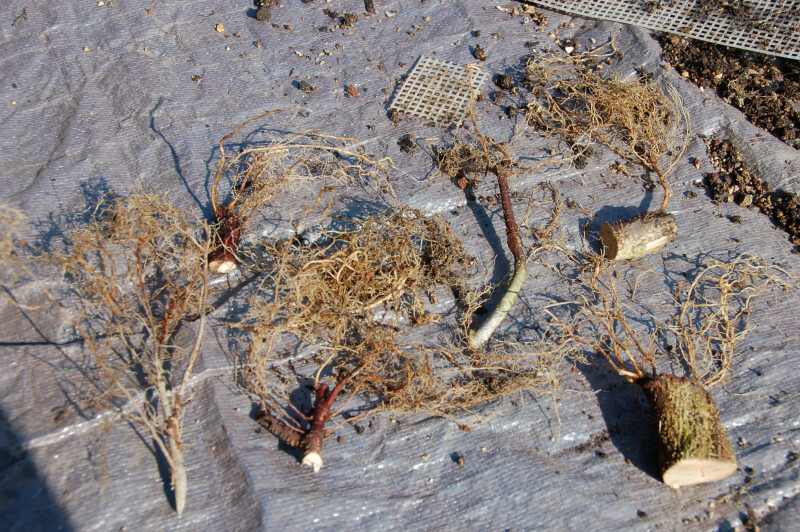 All of these large roots will have to be dealt with over a number of years to reduce their length. 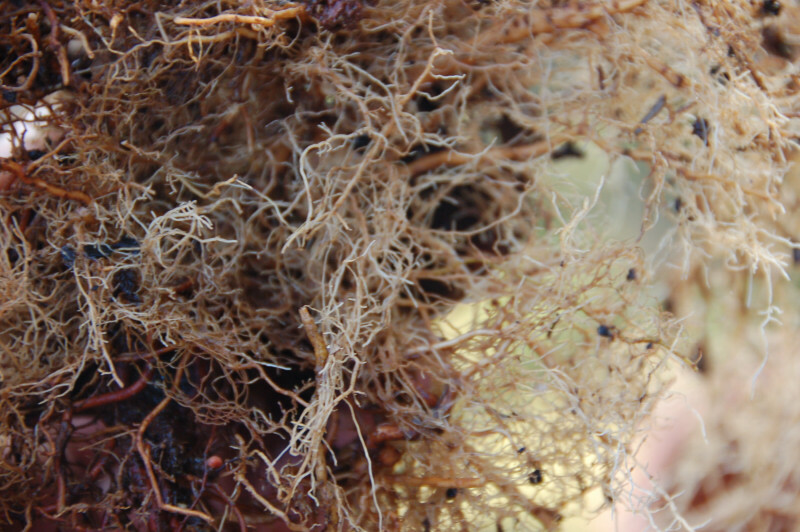 What follows is some pictures of the roots and how they have sprouted from the ends of the cutoff roots. Much of this is due to a combonation of increased air, water and fertilizer. Add to that 10 months of sun and they grow strong here. 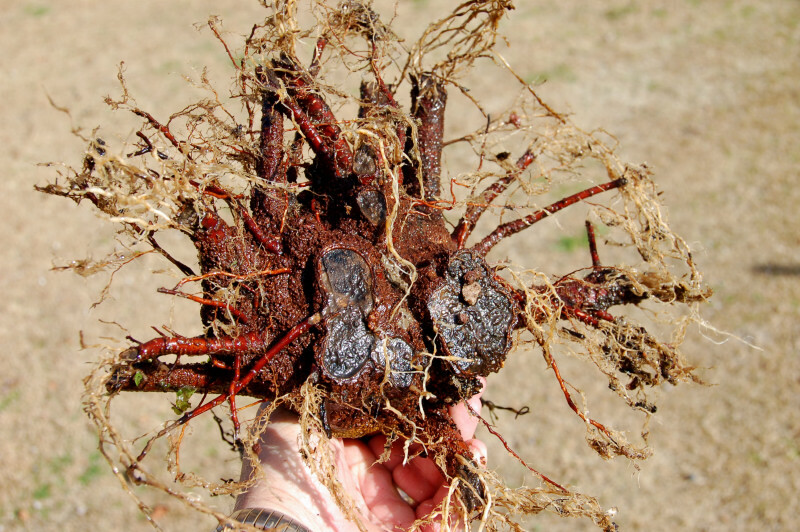 All of the roots have sprouted from the ends. Here is a shot of the base that I cut on my band saw. It is healing well and the callus is rolling over the base. 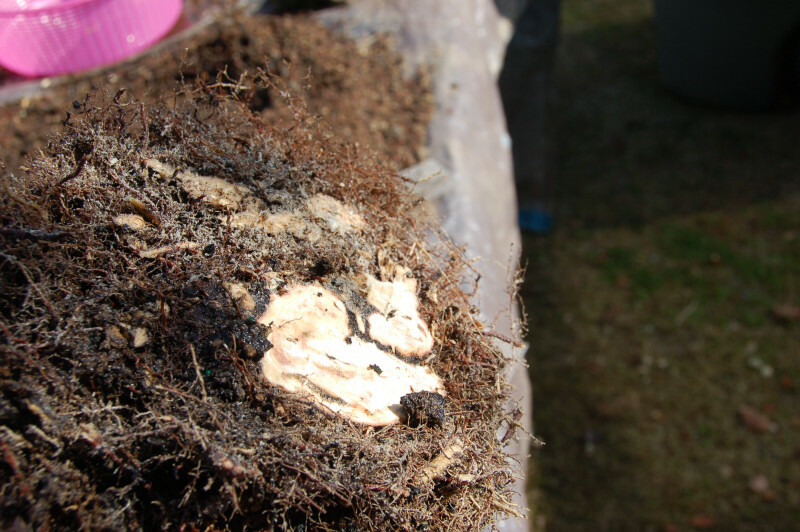 These two roots were far to high on the trunk and will always look like crap. They were about as large as a pencil and I just snipped them off. 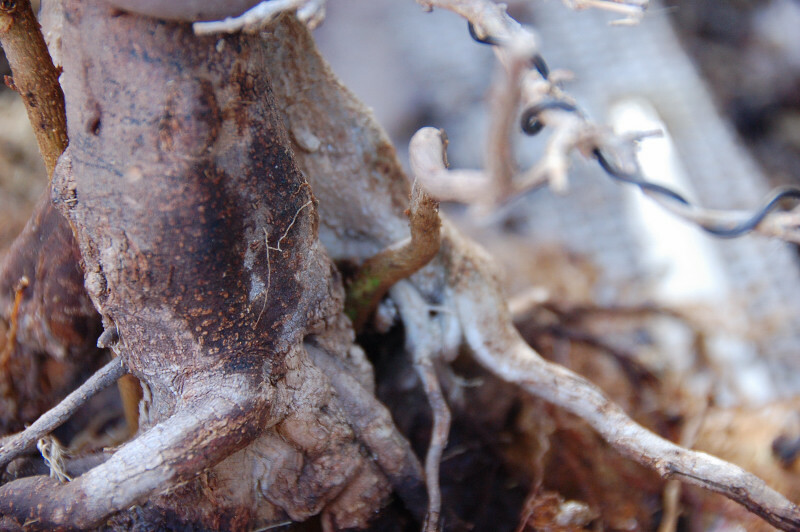 Here is a root upside down that I have reduced back by half. It is cut back on the long bias (at an angle) to expose as much cambium to the ground as possible. 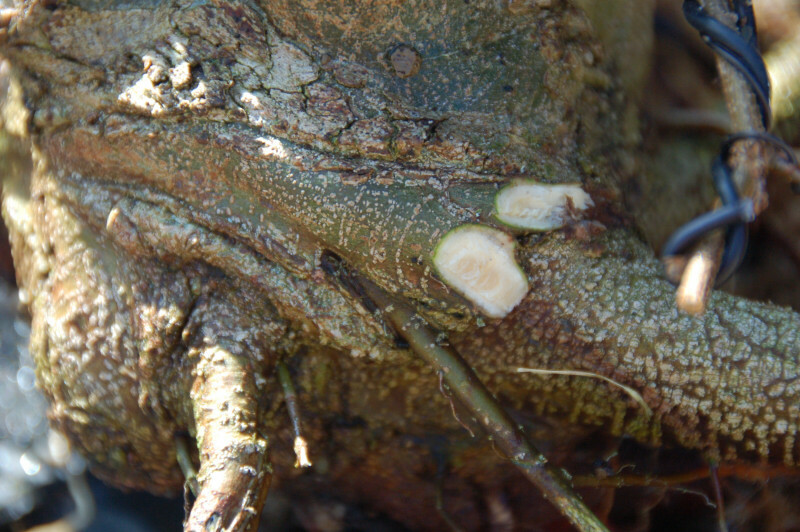 The roots that I hope will sprout back further , closer to the trunk will mean I can cut this back more safely next year. Here is the tree turned right side up and showing the angle parallel to the ground. Here is a very large root. 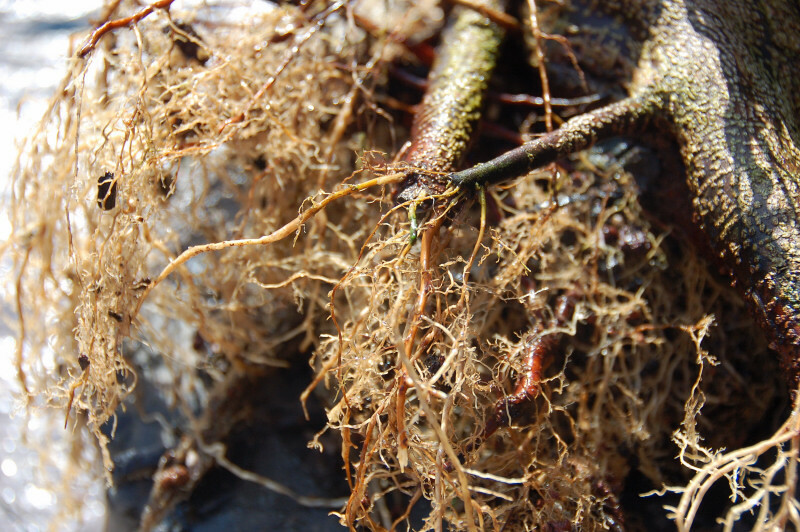 This is roots that one will se in material that has been grown in the ground. They grow large and fast while trying to increase trunk size quickly. 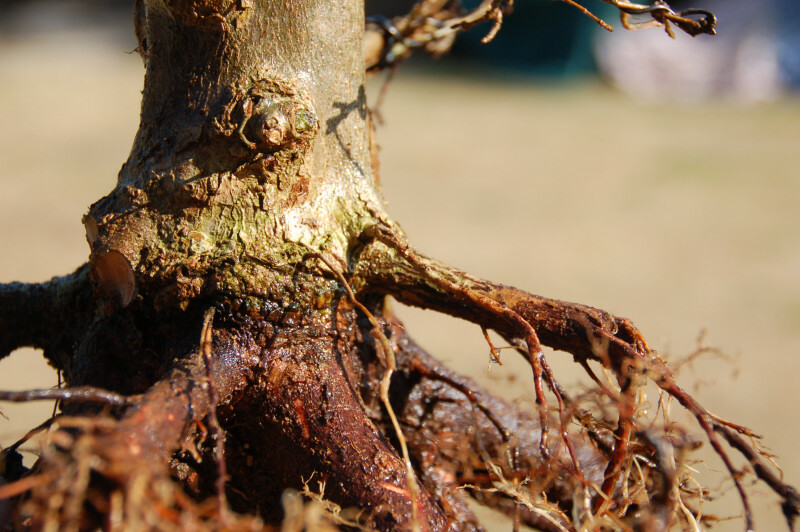 While the trunks are indeed large, so are the roots and it will take a few years to pare them down. 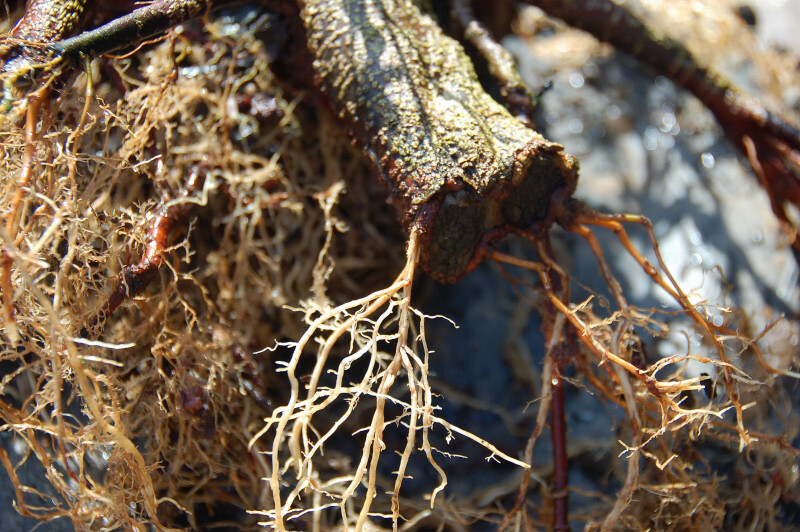 This root is about 1.5 inches across. 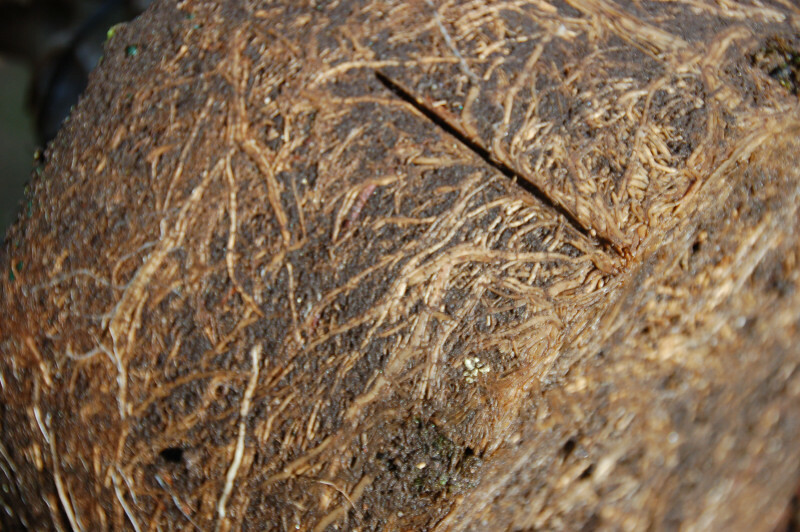 The root is reduced by half. I saw it with a square cut at the end. 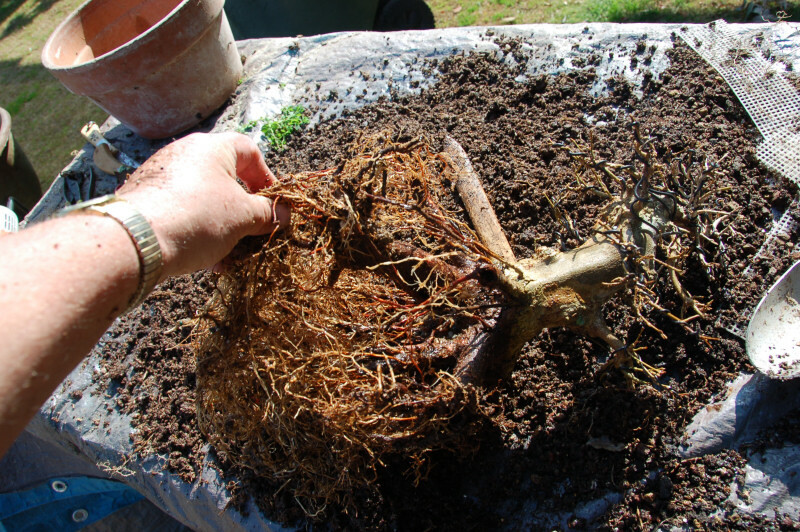 After sawing the root I turn the tree over and begin working on the roots bottom. I split the roof almost in half. This one will be nibbled some more with the knob cutter and then smoothed with a knife. No sealer on these. Here is another about 1/2 inch. 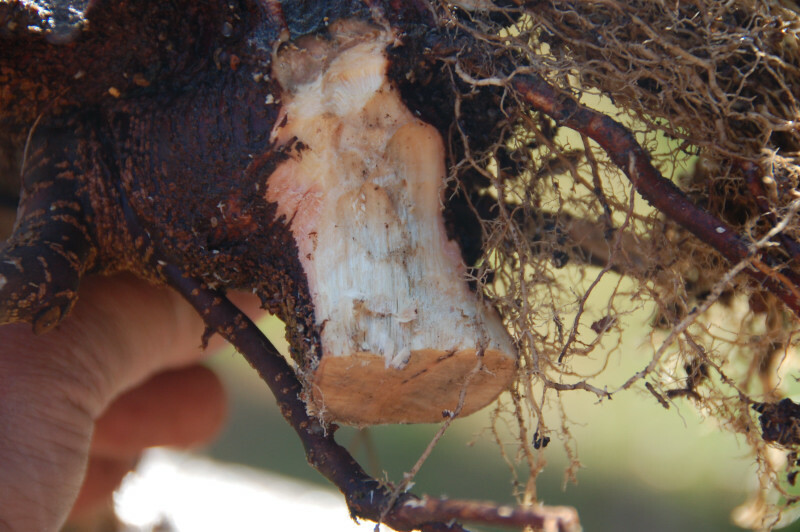 This root was treated the same way. 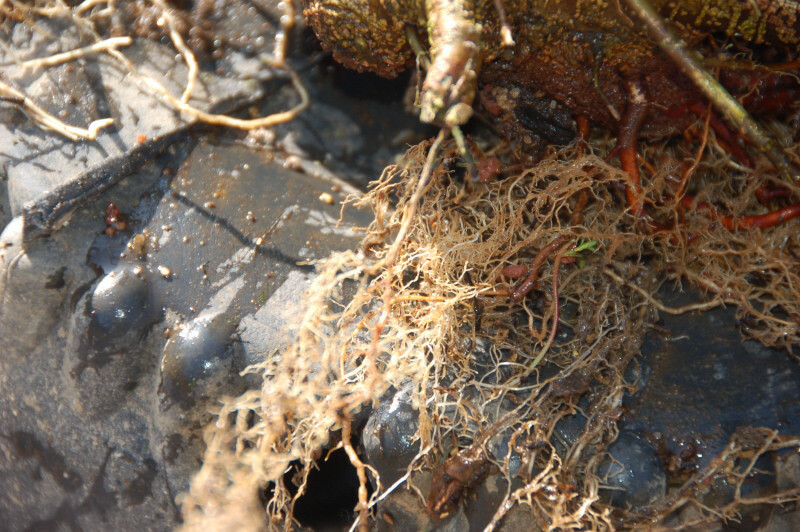 Here is a group shot of the reduced roots. 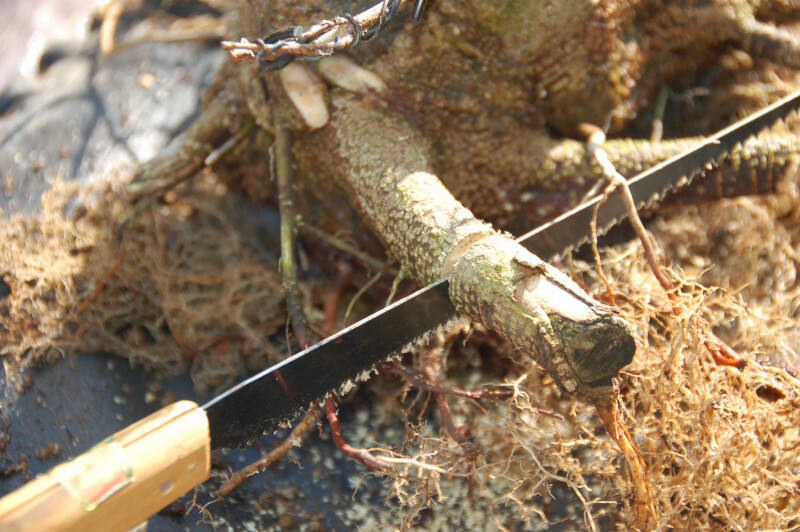 I cut about 60 perecnt of the root tips back on the entire tree. 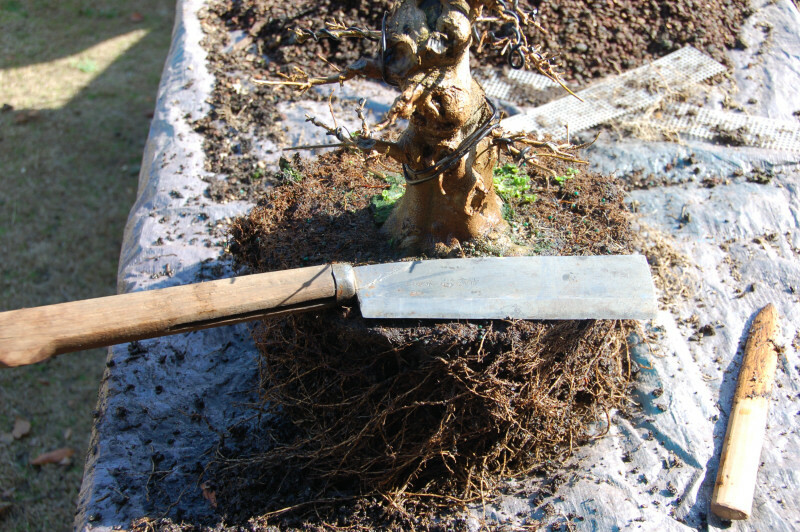 The 40 perecnt I left will help the tree recover as well as the roots that were small and could be kept for the future. 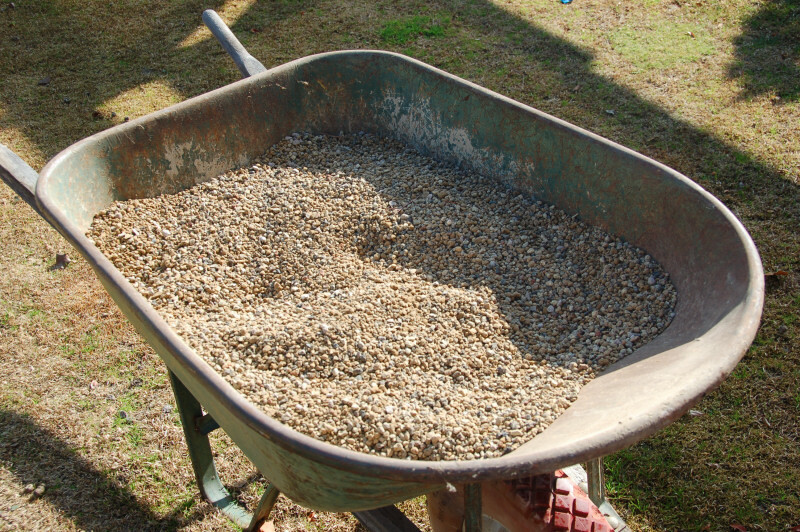 Here is a wheelbarrow full of soil. I went thru two of these while repotting. 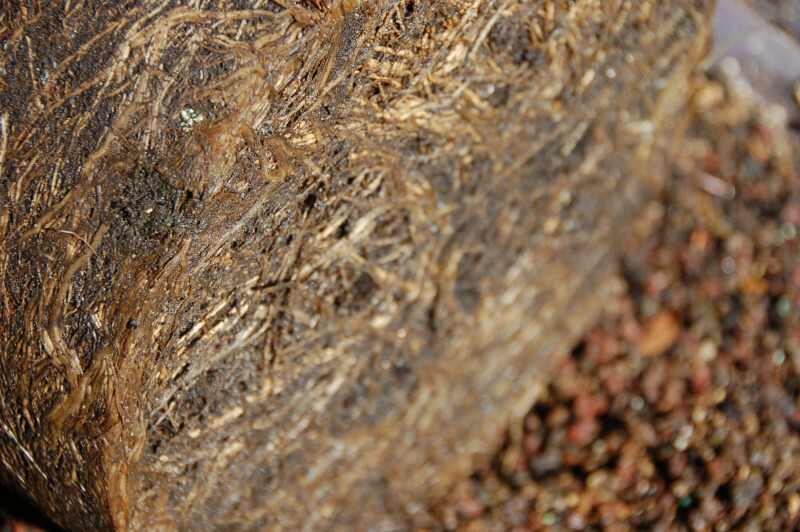 This grow out mix has about 10 percent grow stone in it. 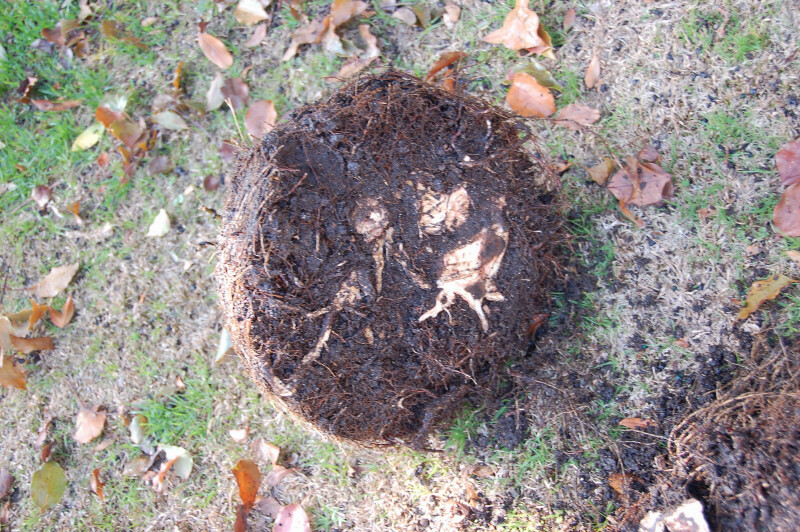 Here was a really compacted root ball. 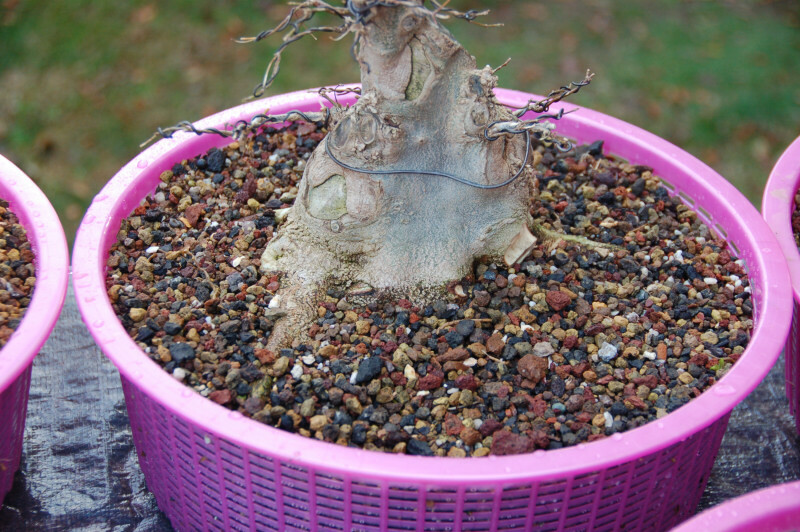 This tree had not been repotted for five years. 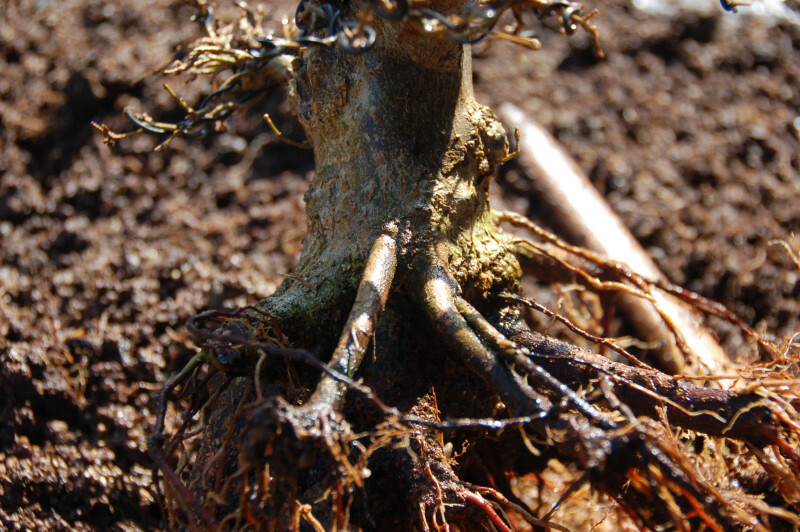 It was soild mass of roots and hard as a brick. 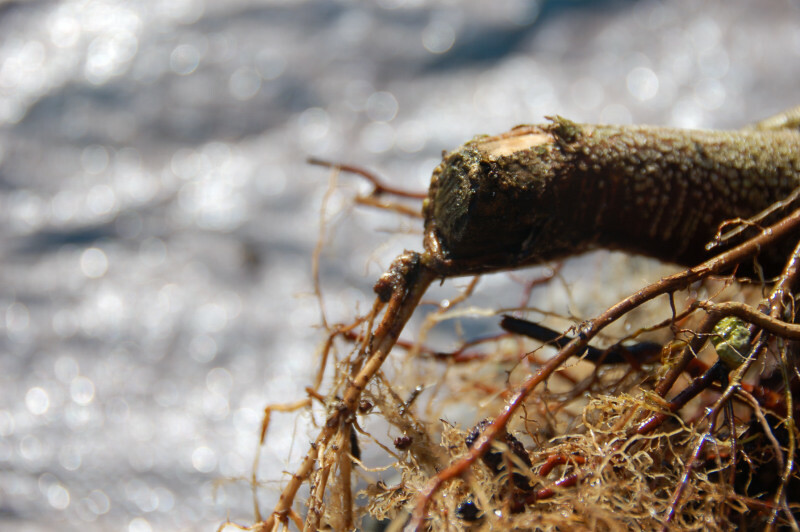 I tried to break up the root mass but it was too hard. I have a very sharp Japanese cleaver that will hack thru a three inch trunk in three whacks. The bottom on the right and whats left and the trunk on the left. here is a good shot of the bottom after seperation. I had no idea I cut thru that much wood. The cleaver just sails thru like butter. So here is the tree efter teasing apart the ball as much as I could. I used a big die grinder with a 1/2 router bit in it to take down some of the wood on the bottom. I took is down about 1/2 inch. 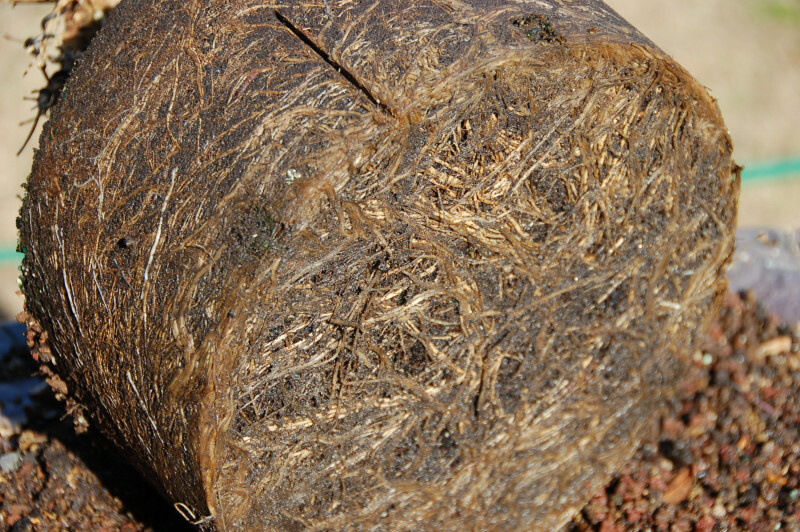 You can use your own palm as a comparison as to how thick the root ball is now. Before I started is was 14 inches tall. Now it is only 2.5 inches. 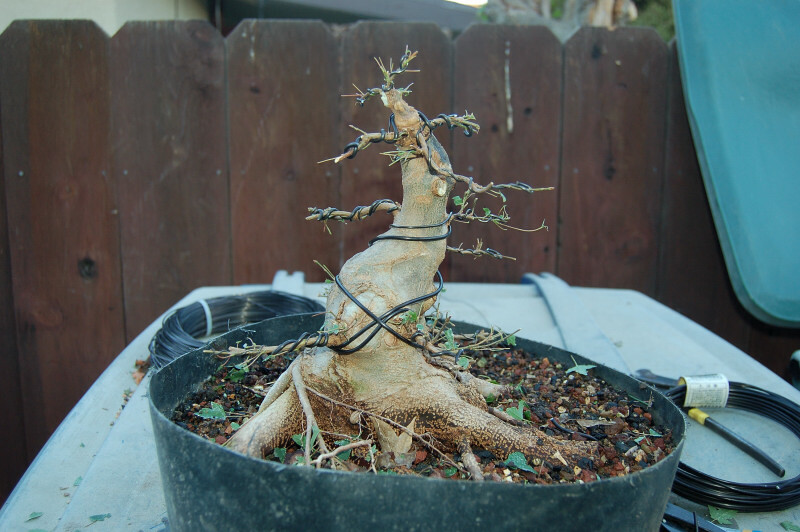 This tree is one I have been working on since I got it in 2009. The branch structure is getting better but the base needs lots of work. 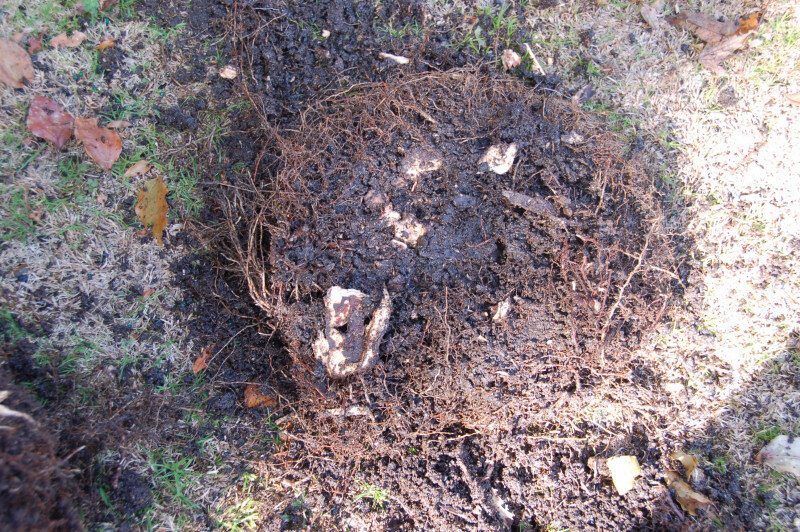 In this view I did a partial ground layer in that void of roots area. 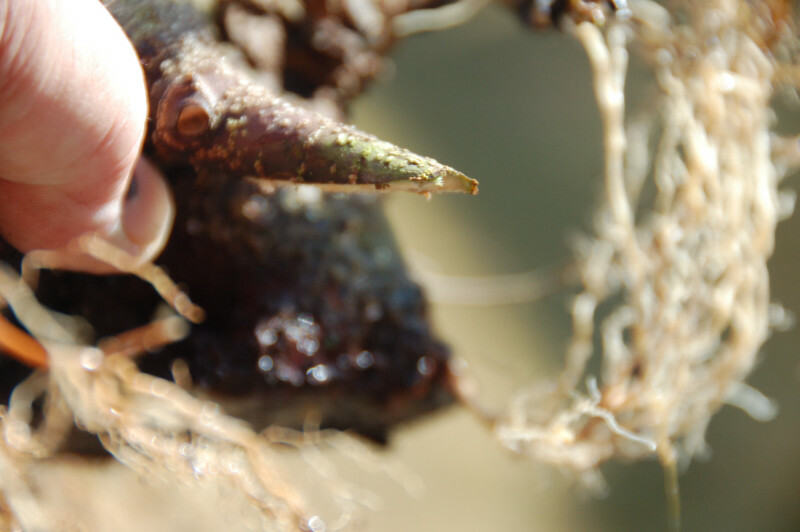 I did get the two small roots you see, and they will get larger. 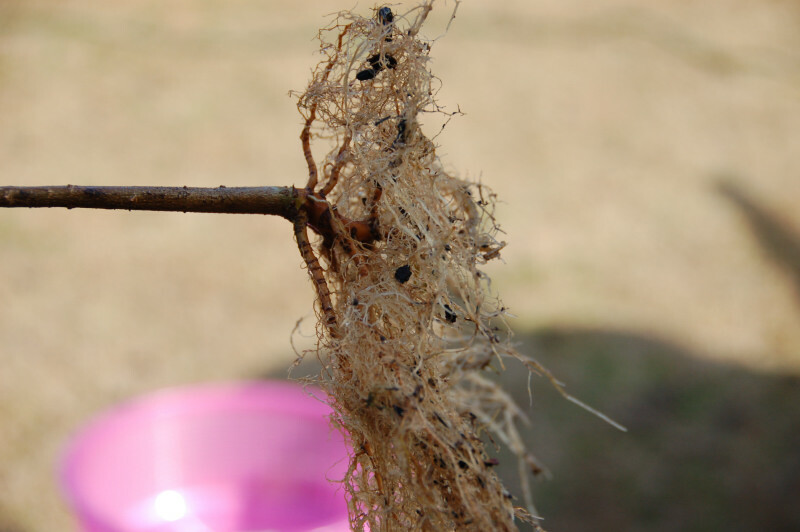 The rest of the tree has a good radial root spread and just needs reducing in length. 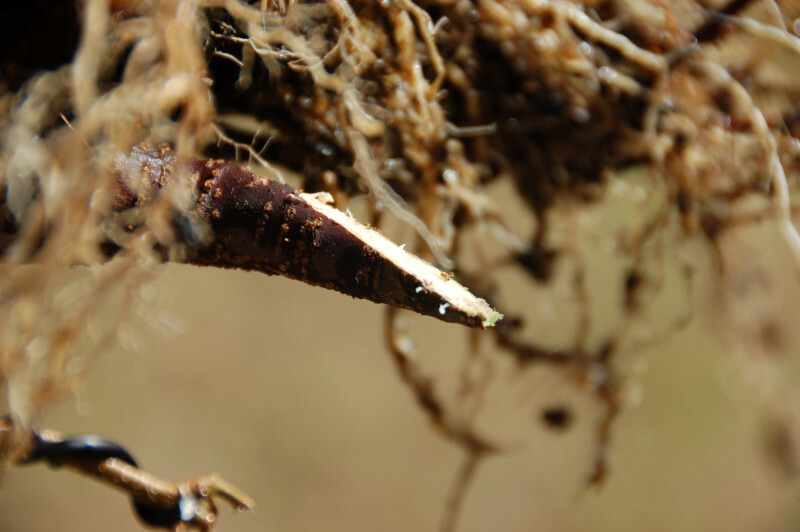 While I do have a good radial root spread, I do have a couple root on the inside that I left last year. These were reduced last year but need further reducing this year. I did not take it off last year due to not having enough roots to feel comfortable in taking off that much roots at once. 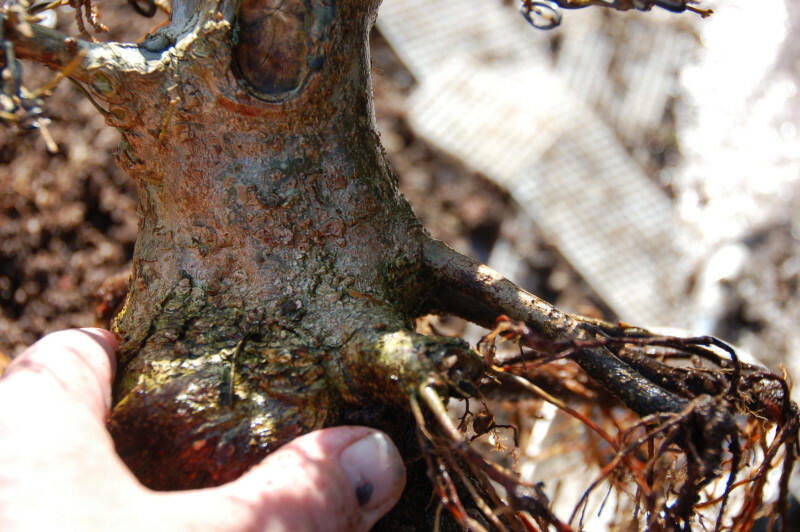 Here I am holding onto the roots extending from the end of the tap root that must be cut off. I just saw it off. 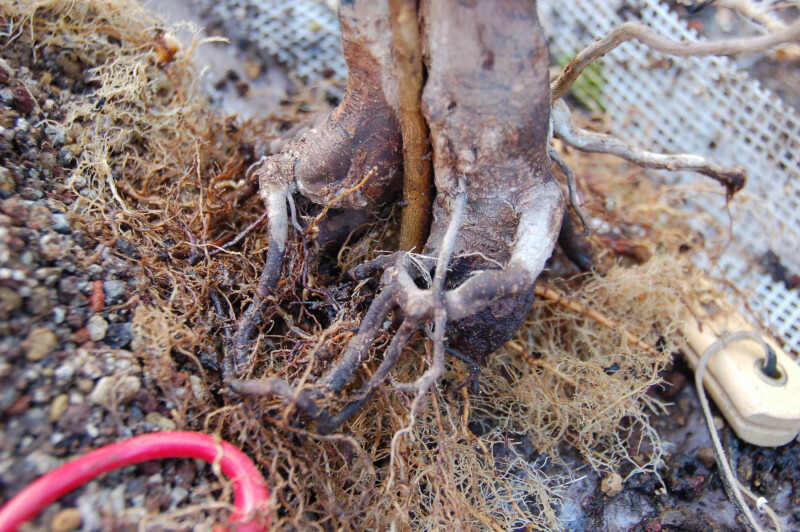 These two roots emerge too high on the trunk for it to lok great in a pot. 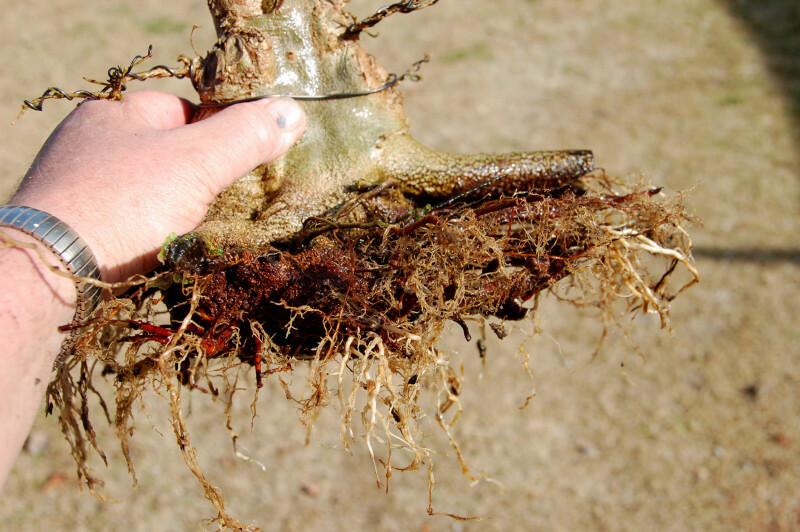 I have a lot of rootage now and the top has been reduced by 75 percent in the fall so removing these roots now is a no brainer. 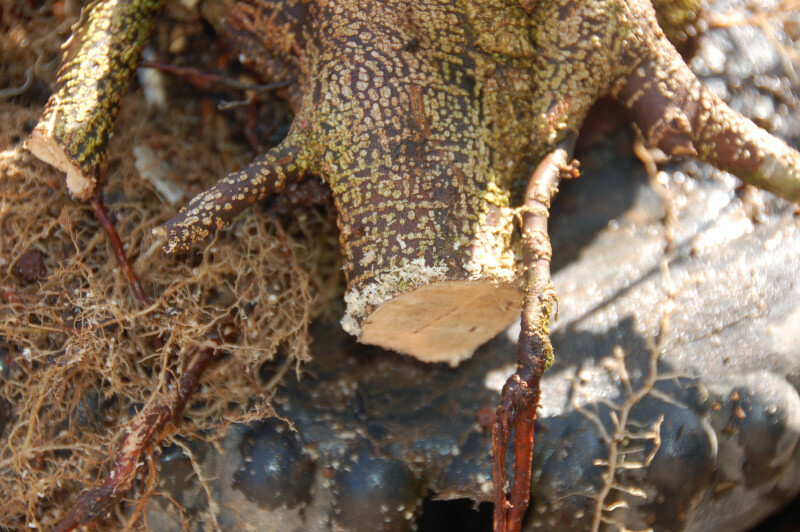 This large root is also to high on the trunk. Time for that to go also. The scars from the previous two and the other side of the other one. 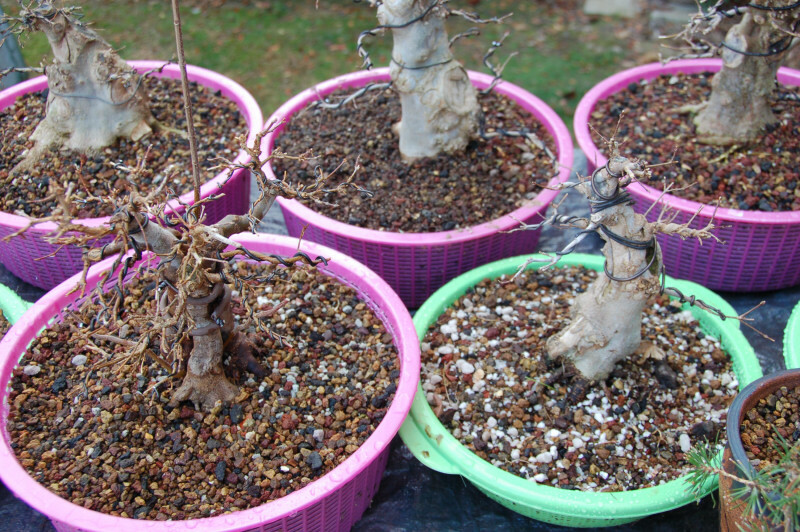 All were removed and it was potted up. 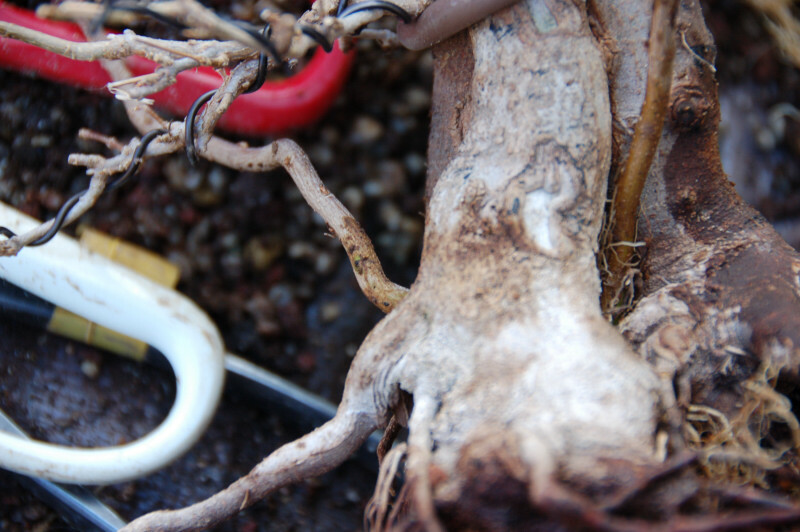 Another trident, this time I show how last years cut back has grown new roots from the tips. 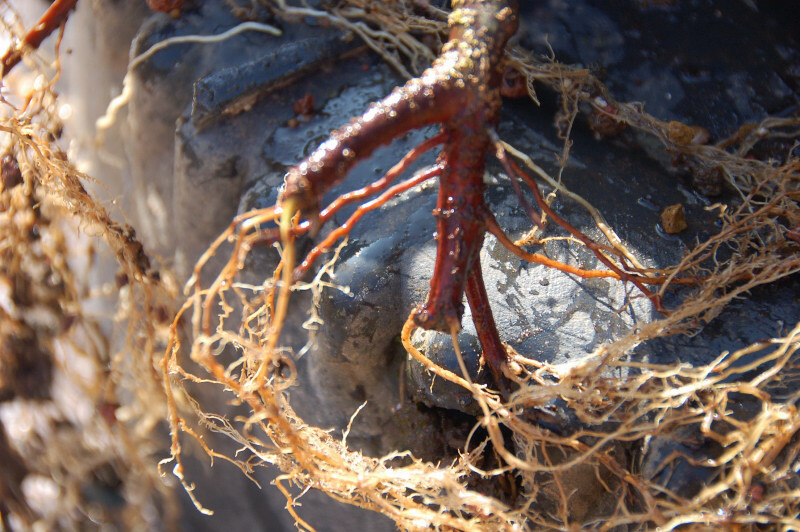 On a healthy trident this happens in about 45 days with new roots pushing out of the tips. This is what the bottom side looks like after trimming last years growth. A few of the larger roots are cut back as previously and split to show more cambium at the bottom helping me next year. Now I started working on Frokensteen. 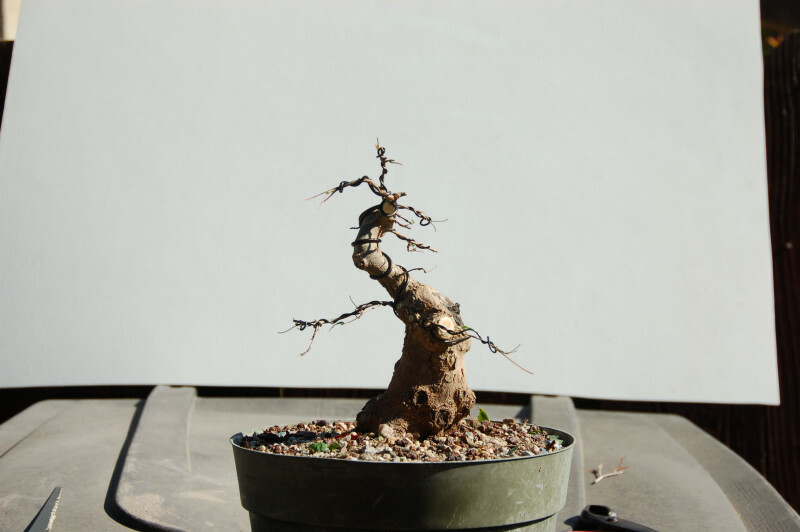 This is the tree blending together three trident maples. 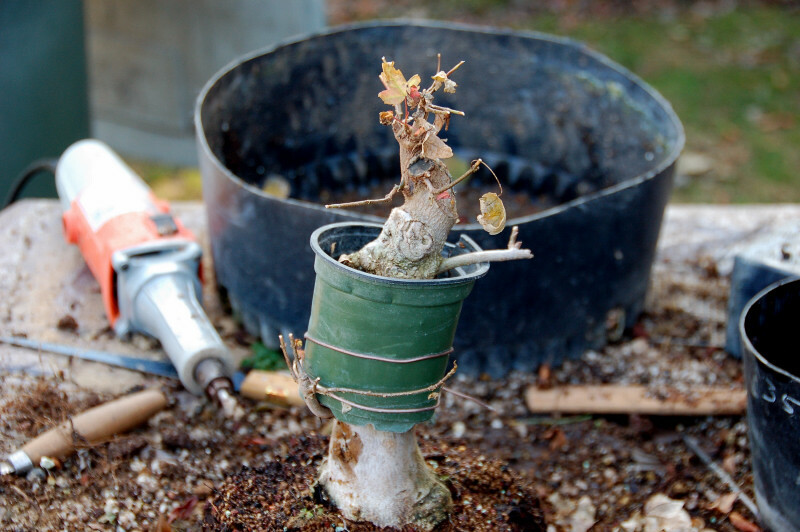 I had some holes in the nebari around the base that would need filling to help the trunk graft together at the base. This is the part of the tree that has to be the most convincing to reall sell that that is one tree. 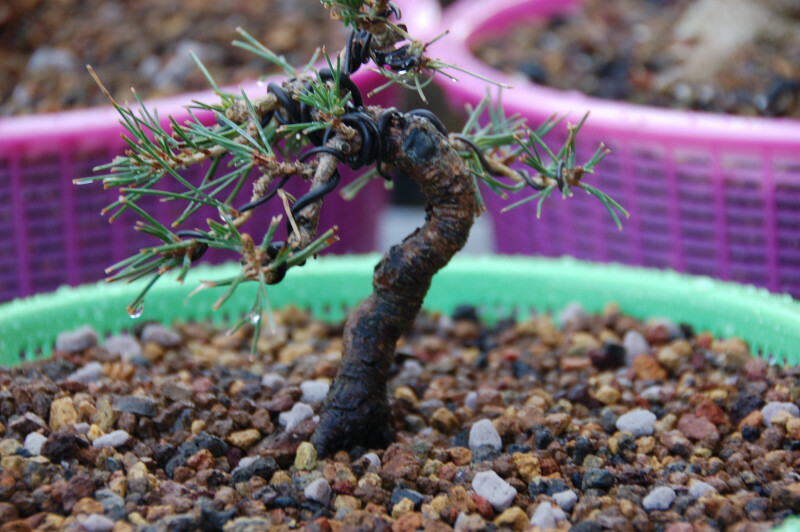 This is a Al Keppler trident seedling. 27 inches tall, about 5/16 at the base. 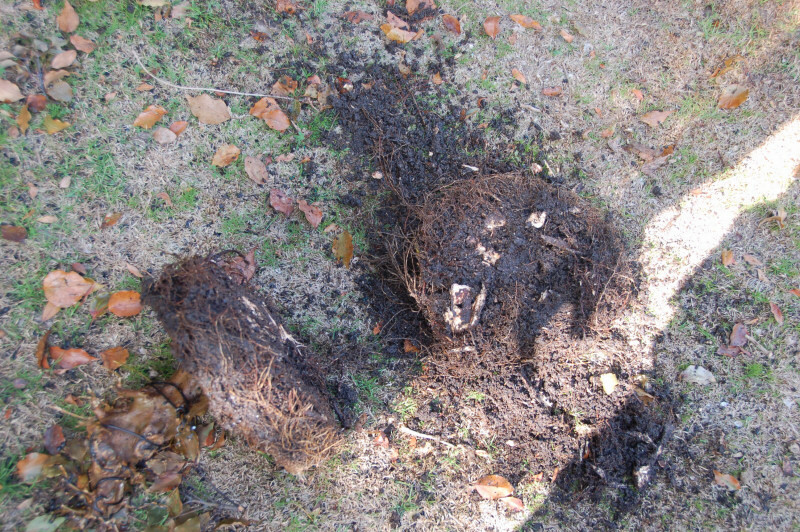 The roots were really well developed. 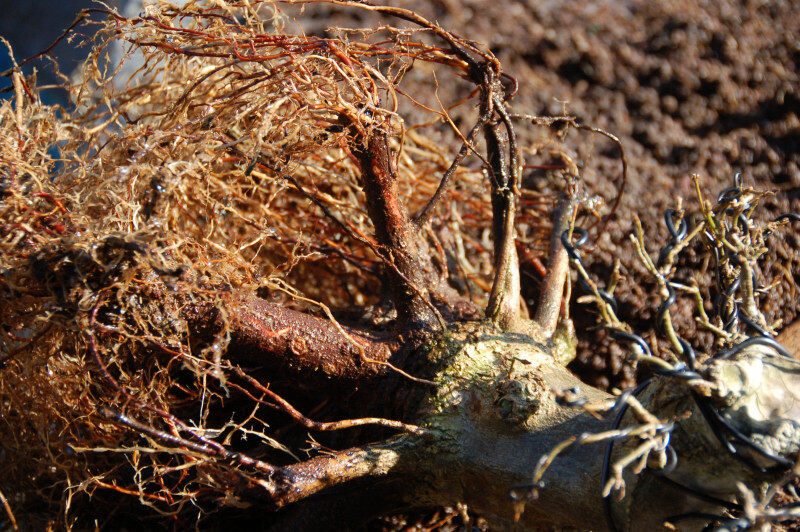 After cutting off the tap root. 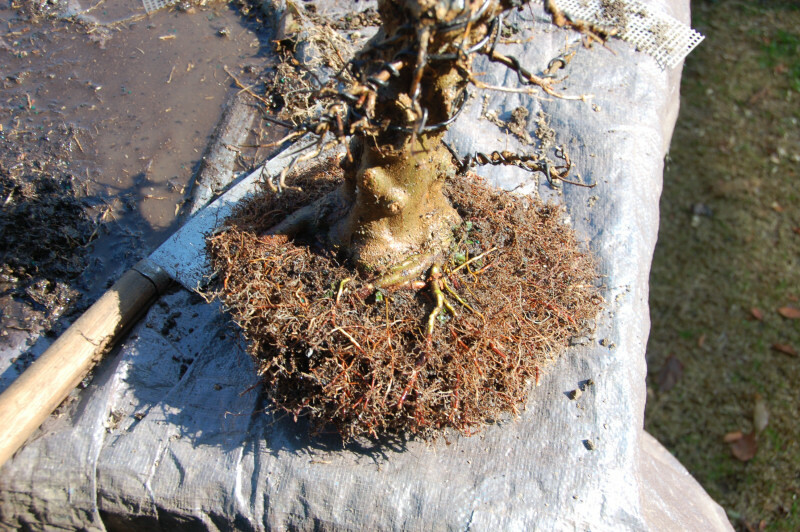 After pruning back to a pad shape. 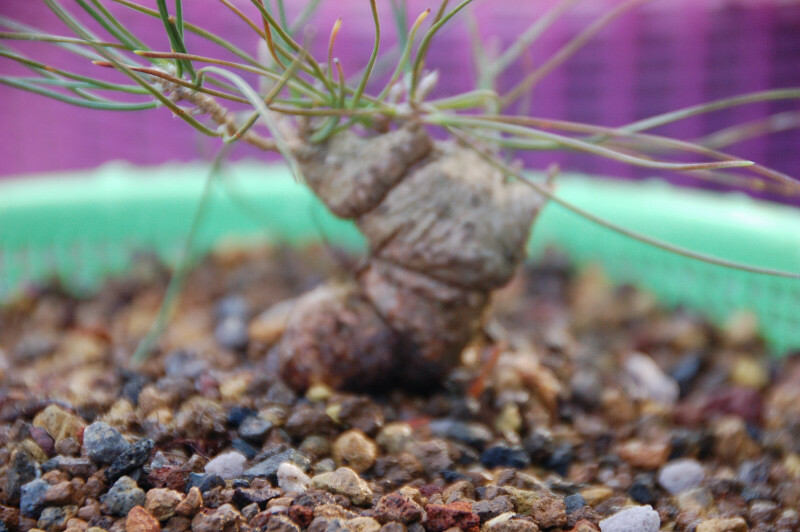 That is a pretty good looking root base for a 10 month old seedling. 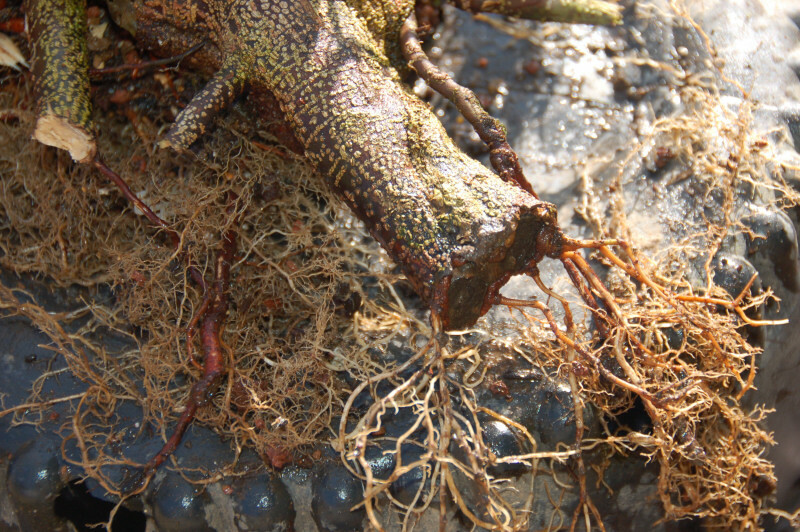 What I did was thread the shoot thru the bottom of the root ball into a hle in the base. This seedling should sell up and fill in the hole in this year easily. I sacrificed two of my twisty seedlings that I grew under screen to fill in a couple other holes I had. These too should help to cole up the bease this year. 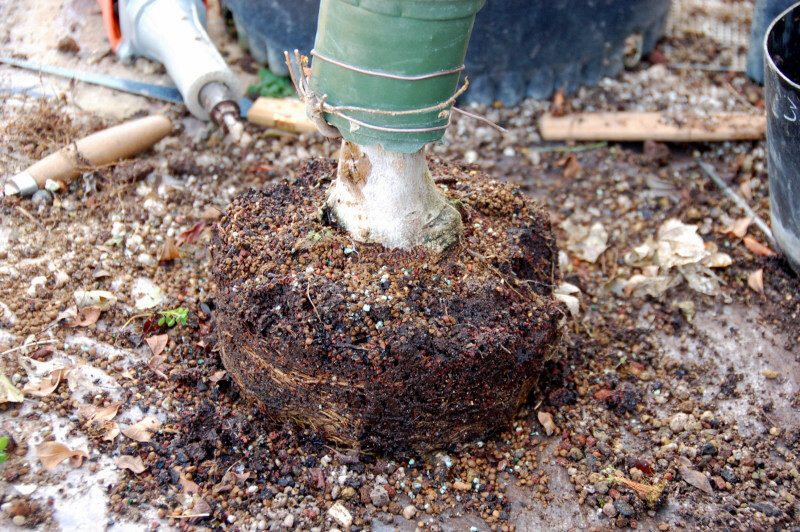 Once the base is totally fused the increased root s will be working as one and the tree should take off. The top will be allowed to throw a sacrifice off of each tree this year. That was something I did not do last year. I think it will fuse faster with the sacrifie. 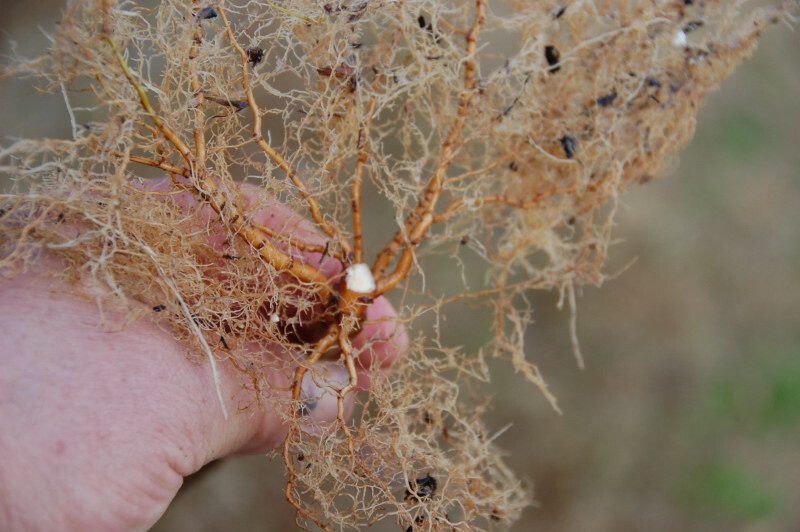 The really white roots are the new tree shown from the bottom. This year if I have better luck at seeds, I will add more trees to the base and really get a spread going. In some of these close ups you can see how much better the bases look in the pots now. This tree, you can make out a scar down low at ground level on the right of a couple roots removed that were too high on the trunk. 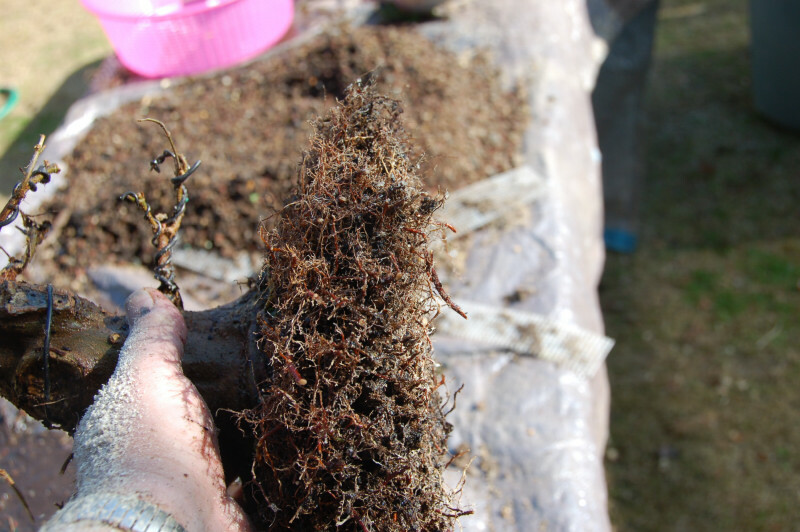 Now the soil is level all the way around and no roots out of the soil. 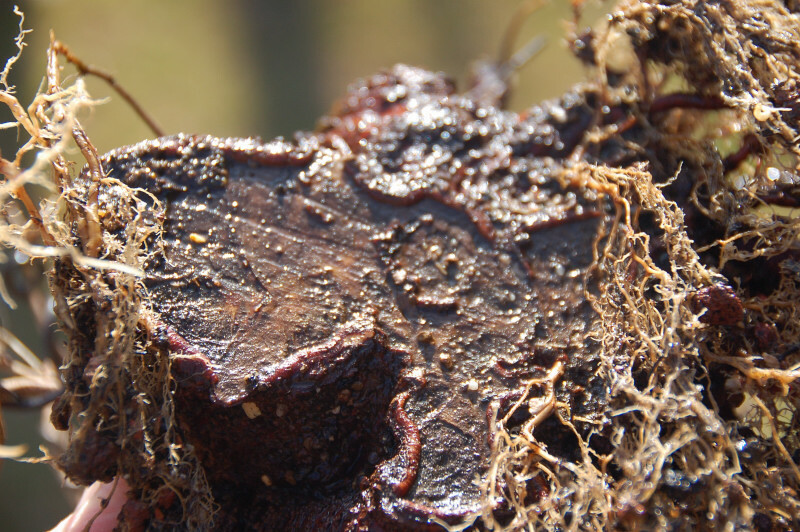 Once the ends root, I can begin exposing the larger roots around the trunk by Fall. 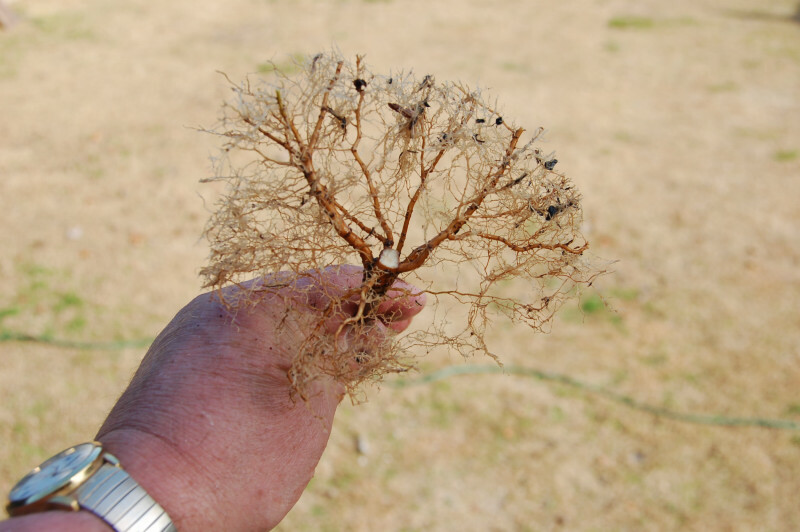 These two also have a nice soil emergence with no roots above the crown of the tree. The tree in the middle is the base of the one I removed the layer off of. It was tilted at an angle and the leader is ready to bolt this year. 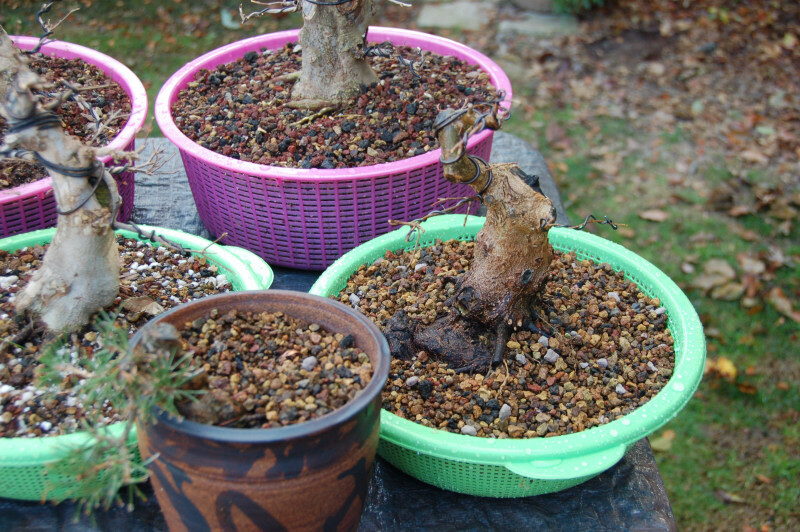 Just a couple pines I repotted to pond colanders to get a better root structure and something I can cut back to get in the correct pot size. This was a taller pine that I did not chop. I purchased like that with the intentions to produce a semi cascade from it. Just planted it into a larger taller pot. This is the last trident I got from Muranaka. Just a large slab of wood under the soil. Repotted it into a larger colander also. Now that’s what I call a days work! How many more to go? I don’t know maybe 60 or 70. These required a lot of work to keep the bases moving for the future. Lots of removing wood and splitting roots and shortening them. Mixed two wheelbarrows full of soil and used nearly all of it. 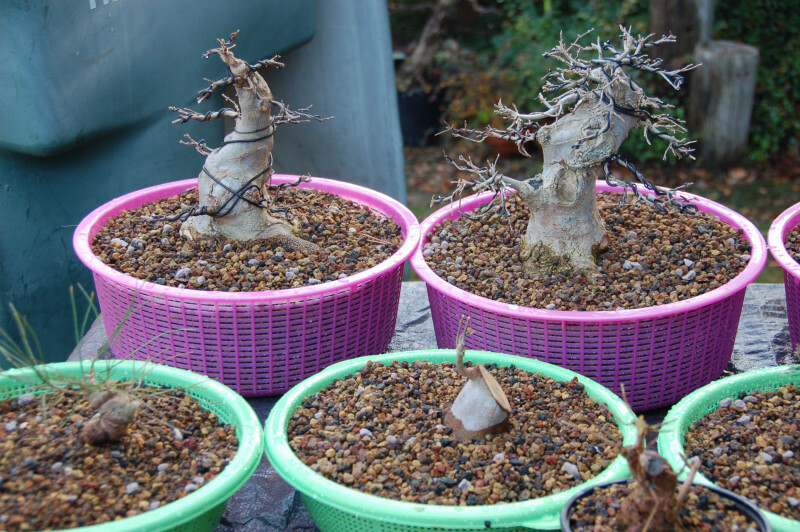 I havn’t even started repotting those in bonsai pots yet. That’s a lot of work Al, but man those are some tasty tridents. 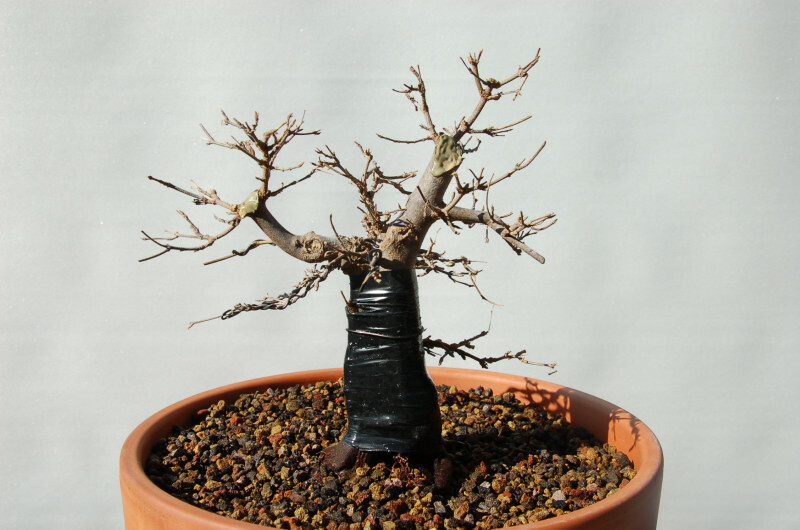 Seeing your posts reminds me that I should focus more on developing prebonsai for the future.